Rare! Unobstructed, unbelievable views of the mountains and city from the 11th floor of the prestigious Penn Square building on the corner of 12th and Pennsylvania. 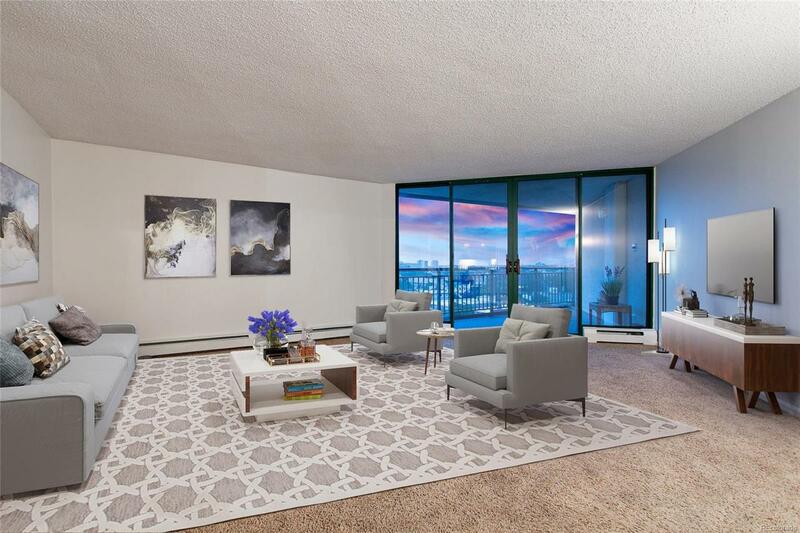 This special condo features all New Paint, New Carpet, New Bosch Washer/Dryer, New Kitchen Appliances, New Quartz Countertops, New Updated Fixtures and Backsplash! Reasonable HOA dues include all water, gas, trash, snow removal, landscaping maintenance, 24/7 Concierge and Security, 21st Floor Rooftop Party Room & Deck with Completely Unobstructed 360 Degree Views of Denver & Mountains, 1st Floor Meeting/Party Room off Pool with Full Kitchen, Wi-Fi, & Big Screen TV; Guest Suite for Visitors, Gazebo, Grills, Large Workout Facility, Outdoor 15 Meter Pool, and more. Walkable to Cherry Creek Trail, Shopping, Museums, and all the Hotspots in the Fabulous and Historic Capitol Hill! With 2 parking spaces, 1 Deeded Oversized Parking Space, AND and a 2nd paid underground parking space...a huge asset in Cap Hill!